Emergency services currently stand on the verge of arguably the most profound operational change in a generation, with the wholesale move from narrowband to broadband communications now a core topic of discussion in jurisdictions across the globe. A country which is well advanced in its move from digital two-way radio to LTE is the UK, with the burgeoning Emergency Services Network project set to complete its roll-out at some point after 2020. The rest of the world is progressing well too, however, with South Korea and the United States having both already issued supplier contracts for their respective 4G public safety networks, and the latter’s FirstNet project recently receiving sign-up from each of the country’s 50 states. Focusing specifically on the UK for a moment, the initial reaction to the news of a new critical comms network was hardly enthusiastic, with particular objections – certainly from within the emergency services community itself – focusing on the perceived danger that a hypothetical lack of coverage could potentially lead to the system failing at times of essential need. When I can’t even get reliable 4G walking down the road to the shops, ran the argument, why should I feel comfortable sending my officers into a mission-critical situation with only a smartphone standing between them and disaster? While certainly a perfectly reasonable concern, there is the sense now that of course the network will function as it should, if for no other reason than the sheer amount of cash being thrown at the project by core contractor EE, on whose pre-existing commercial network ESN will piggyback. (When the roll-out actually completes is another conversation entirely, with no current visibility on timescales, as per a Home Office announcement made at the end of last year). With that in mind, the focus has for the most part moved from ‘will it work?’ to ‘what are we going to do with it once it arrives?’. Taking crucial network coverage and push-to-talk functionality as a given, how are we going to best exploit all this data that we now have the opportunity to send over the air from the scene in real time? There are also other questions that aren’t necessarily being as readily addressed, however; for instance, on the changing role, and even ‘identity’, of emergency services personnel as they begin to operate in such an extraordinarily information-rich environment. The potential effect of innovations such as virtual/mixed reality on the cognitive function of police officers, paramedics and firefighters is also an incredibly fertile area for discussion. What exactly is the first-responder of the future going to look like? Perhaps the best place to start in examining the potential effects of vastly increased data use is with technology that has already been deployed by emergency services, but will likely only really come into its own once blanket mission-critical 4G coverage is established. The two most pertinent examples of this are mobile smart devices (currently facilitated by contracts with individual MNOs on a regional, organisation-by-organisation basis) and body-worn video. The latter in particular is in the process of revolutionising police work, nationally and internationally. Speaking of the impact of BWV, both currently and going forward, director of UK think-tank the Police Foundation Rick Muir says: “For me, body-worn is the biggest game-changer for the police in recent years, quite simply because of the advances it brings when it comes to the collection of evidence. According to Muir, however, as well as improving the conviction rate, the use of body-worn video also has a more profound effect in that it subtly changes interactions between officers and the public, with both now aware they need to be on their best behaviour. In his words, this simultaneously increases the sense of “legitimacy”, something which is so important with regards to what’s known as the quintessentially British model of ‘policing through consent’. The first thing we can say about the ‘first-responder of the future’ then is that they will be more accountable – thanks, at least in part, to a small device worn on the lapel (which at some point may also give the option of streaming footage of incidents in real time). For Muir this is also being augmented by the public’s eagerness to film their own interactions with the police, often with an eye to posting them on YouTube or social media sites such as Twitter. This, according to him, is also going to have a major impact on the role. Moving onto the greater use of broadband-enabled devices – for instance, as recently rolled out across Greater Manchester Police – Muir highlights current advantages being primarily in the realms of cost-efficiency via email, alongside applications such as Motorola Solutions’ Pronto. These allow officers to perform ‘administrative’ duties such as filling in paperwork while on the move, thereby keeping them on the beat for longer. According to him, the need to trudge back to the station to deal with paperwork has “bedevilled” police work since its inception. Technology is therefore not only allowing first-responders to become more flexible in terms of time and resources management, but also more ‘available’ when it comes to their relationship with the public. As suggested by Muir, evidence extracted from body worn video devices enables prosecutors to offer an improved sense of ‘the scene’ when a case comes to court. With that in mind, if and when BWV footage becomes readily and reliably ‘streamable’, the technology clearly also has the potential to offer the emergency services themselves comparable insight into an incident, only this time taking place as it is occurring. This leads us into the second attribute of the first-responder of the future – possession of increased situational awareness. Ken Rehbehn is principal analyst for industry consultancy Critical Communications Insights LLC, as well as a volunteer firefighter based in the vicinity of Washington, DC. He continues: “The challenge in relation to that is the usability of the data itself once it arrives on the scene. Firefighting takes place in an incredibly limited and cumbersome environment, offering very little ability to manipulate buttons or controls with your fingers. I expect some interesting innovations in providing heads-up displays when it comes to things like breathing apparatus. As outlined by Rehbehn, first-person, on-scene situational awareness could be an extraordinarily useful tool for first-responders across the emergency services. Couple this with ability to instantly access ‘ambient’ environmental details such as pre-existing areas of structural instability or information about building materials and we could see something truly game-changing. 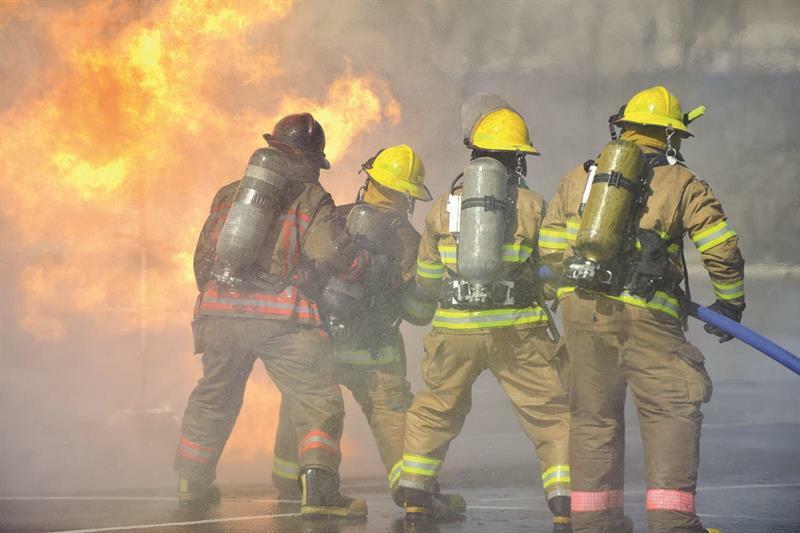 As might be imagined, a variety of manufacturers are now investing in the development of solutions through which first-responders can become better informed about their immediate environment. A major player in this field is, once again, Motorola Solutions which, as one of the three main contractors on the project, is also a major contributor to the Emergency Services Network in the UK. A core product in the company’s current portfolio is its CommandCentral Aware control room suite, which it describes as “aggregating and integrating” numerous heavily data-dependent sources including streaming video, social media analytics, resource tracking and computer aided dispatch into a “single, intuitive interface with layered geospatial mapping”. Again, the operational possibilities would appear to be endless. Going back to the subject of what role first-responders play in all this, does Rehbehn believe their function will change? And if so, will this have a knock-on effect in relation to a shift of identity within the role? “Access to new tools will require different ways of working, certainly,” he says. “This will undoubtedly evolve as practitioners learn how to make the most of the tools which have been given to them. Working on the basis that blanket LTE coverage (coupled with the widespread acceptance of cloud storage) will indeed provide palpable benefits to the emergency services, there is currently a relatively high level of good feeling within the sector. As discussed so far, it would appear that this optimism is not misplaced. At the same time, however, it is also clear that newfound opportunities to endlessly obtain and analyse data places the emergency services in a potentially invidious position when it comes to their relationship with the public. How exactly do you maintain trust while simultaneously having access to levels of information that in the fullness of time could put 1984’s Big Brother in the shade? Clearly, this question not only has implications for emergency services organisations as a whole, but also the individuals who work for them. As many readers of TETRA Today – or indeed, fans of cop show The Wire – will be aware, policing is at its core an information-based business. At no point in the history of law enforcement, however, has so much pertinent intelligence been as readily available as it is now, prior to a crime even being committed. The Police Foundation’s Muir gives an overview of police forces’ current use of ‘personal’ data to identify potentially volatile situations. “A lot of the work going on at the moment is around what’s known as predictive policing,” he says, “which comes from having a better understanding of levels of crime concentration and risk. Information is currently being used to inform that, much of which is being provided by other emergency services, social care organisations, charities and so on. As positive as the use of this technology clearly is, it’s an area that does throw up a variety of potential ethical issues, in particular around notions of freedom and personal responsibility, not to say privacy. At the risk of veering too much into the realm of sci-fi, for instance, the increasingly sophisticated use of AI analysis could conceivably lead to crimes being solved, Minority Report-style, before they are even committed. This is something which is already being experimented with by one UK force, whose HART (harm assessment risk tool) quantifies the possibility of repeat offending. As reported in the press last year, meanwhile, personal data extracted from a variety of IoT-connected devices – for instance, a Fitbit – was used as evidence in the prosecution of at least three serious crimes in the US. Alongside artificial intelligence, another massively hot topic in public safety comms at the moment is virtual/augmented reality, the use of which is being explored by emergency services across the globe through a variety of use-cases. Again, the advantages which the deployment of this kind of ‘immersive’ environment could bring are apparent; for instance, in providing the aforementioned increased situational awareness for incident commanders in the control room. As a training tool, meanwhile, it provides the opportunity for those preparing for life on the front line to experience increasingly realistic situations first-hand, in complete safety. At the same time, questions clearly have to be asked about the potential effect on practitioners’ cognitive function as the necessity to spend time in the ‘unreal’ world gradually increases. For instance, will immersion in simulated mission-critical situations, where there is no danger by definition, lead to an increased willingness to take unnecessary risks in the field? RiVR (Reality in Virtual Reality) is a company currently working with fire and rescue services to produce photo-realistic arson investigation scenarios. It does this by using ‘photogrammetry’ software to produce realistic ‘room scale’ environments, which are subsequently experienced via a headset attached to a high-end gaming PC. He continues: “The key for us is making the experience as photo-realistic as possible, which we accomplish through the use of photogrammetry. We have to make sure that the user believes they’re in the ‘real’ world. They retain what they’ve seen and done as a real memory. Speaking of the potential for the technology to encourage an increase in risk-taking, Woodward believes that, if anything, VR is likely to make frontline practitioners even more assiduous than before, again because of the vivid nature of the memories that have been created. Digital communications technology is going to fundamentally change how public safety officials conduct their business going forward. This will take place in relatively obvious ways; for instance, with drones providing greater visual intelligence in real time, or the increasingly sophisticated use of analytics to facilitate ‘predictive’ policing. At the same time, there are also continuing discussions to be had about practitioners’ relationship with the technology itself. This could be in relation to the use of virtual reality headsets, or even what happens to a police officer’s memory for detail over time when all the evidence is caught on camera.